It has been heartening this autumn to see more people out blackberrying than I remember for several years. ‘Blegging’, we called it in Yorkshire when I was a child, and Sunday afternoons in late summer and early autumn would see us plundering brambles down by the river or up on the edge of the moors, taking home what we didn’t stuff into our mouths on the spot for mother to turn into blackberry-and-apple pie. Now, the blackberries are gone-plundered or withered on the vine-and the sloes are ready to be plucked from blackthorn-always better, they say, after a frost or two. But sloes are not especially eye-catching; their dull bloom allows them to blend into the shadows. 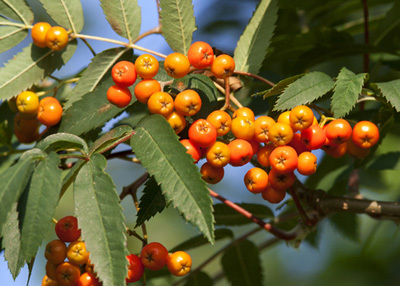 It’s the red and orange berries that are most telling if you want berries for beauty rather then sustenance, although crab apples fulfill both requirements and also do their bit to feed the birds. If I could choose just one crab apple, it would be Veitch’s Scarlet, as the fruits are of a size and colour to make them both beautiful and useful. Bigger than a gobstopper and the brightest of reds, they hang from the modest-sized tree looking for all the world like Christmas-tree baubles. Pick them to make crab-apple jelly or admire them where they hang until they fall and provide food for the birds-with any luck, common or garden blackbirds will be augmented by flocks of redwings-one of the perks of allowing fruits to remain where they fall rather than tidying them away. The birds will also enjoy pyracantha (firethorn). Its fruits may be had in red, orange or yellow and that seems to be the order of preference for the birds, although in a mild autumn, where there’s still plenty of food to be had, it will be some time before the bushes are stripped. Pyracantha makes a great hedge or a shrub for walls of any aspect, provided its stems are regularly tied-in. I’ve seen specimens so carefully sculpted as to run along each mortar course in a stone house wall. Alas, I’ve never had the time available in my day to devote to this extreme form of training, but I sigh with admiration at such artistry. The thorns on pyracantha make it a good shrub for bird nesting, as the armament deters cats and humans who might be intent on finding a way through the thicket of branches. But the shrub is out-done by another berry-bearer that I value hugely. The cockspur thorn (Crataegus crusgalli) makes a small, spreading tree, perhaps 15ft-20ft tall in time. Its leaves are glossy and green until autumn, when they become flushed first with amber and then with scarlet before they fall. The creamy-white spring blossom is followed by scarlet berries-larger than those of hawthorn but smaller than crab apples-and these decorate the branches long after the leaves have tumbled. Should you plant the cockspur thorn in a lawn, as I have done, take care to raise the canopy above head height, or the inch-long thorns will give you cause to regret your positioning. That said, I wouldn’t be without this tree, which is a really good all-rounder, even if I do mutter to myself in early winter when the berries fall and turn to mush on the lawn below. Plant it at the back of a bed or border and this shedding will present no problem at all, and you’ll have all the joy with none of the irritation, provided you don’t get too close to it except to remove unwanted branches. No thicket is more discouraging of trespassers. And then there are the hedgerows, awash as I write with rose hips, haws and those startlingly contrasting fruits of the spindle tree (Euonymus europaeus). The outer casing is shocking pink and, when this splits open, the berry revealed within is a striking shade of orange-and if I’m not mistaken, this colour combination is also high fashion at the moment.